nesdev.com • View topic - Famicom stopped working - Recommendations? Post subject: Re: Famicom stopped working - Recommendations? About USA SNES, PAL SNES and SF PSUs, I think there might be AC/DC differences for different regions actually. I bought this PAL SNES in Germany a few months ago, but all my life I've used USA consoles exclusively. My original consoles are back home and don't have them to check atm, but so far I have seen some pics of SNES PSU from different regions and seems that the NTSC (USA/Japan) output DC and the PAL ones output AC. Jeez. I will try to upload a complete report of the debugging soon. Keep us informed and good luck! - The power sub-board seems to work correctly, I followed the power flow up until the on-off switch and it was all ~5v. - Just in case I checked if there was any voltage in the mainboard, but there wasn't. There I saw the VCC marked cable, and in the back of the board I saw that the two cables to the (right in the photo) of the one marking VCC are connected. None was delivering any current to the main board. 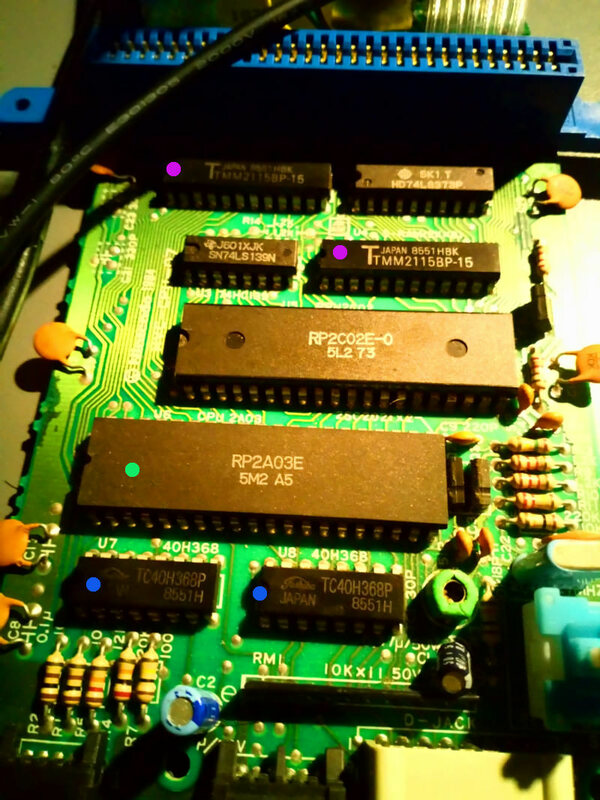 - The 7805 is now outputting what seems to be exactly 3V. Not sure if this is the normal behavior. - Now the mother board is powered with the same charge of 3V, by the three cables mentioned before. Here I marked the ICs with dots to find them easier. - The blue dotted ones (TC40H368P) don't heat at all. - Also both ones next to the purple dotted ones (SN74LS139N and HD74LS373P) doesn't seem to heat at all. - The green dotted one (RP2A03E) and the one above it (RP2C02E-0) heat up a bit. Let's say they get warm. - The purple dotted ones which are both TMM2115BP-15 start heating up. If I leave my finger on it, it burns a bit after some seconds. My knowledge on these motherboards is pretty much null, so I don't really know what is each IC. How much heat should they produce? After maybe 3-4-5 minutes I started smelling a bit of heated up plastic. And smelling around, I found out that it came from the power sub-board. - Then, I realized that the whole metal cover had an intense heat, that would burn my fingers if I touched it. - I turned it off and unplugged everything. - I plugged the PSU and turned on the famicom again after everything cooled down (10~ mins). - I noticed that the 7805 was heating up really fast, heating the small heat sink and the whole metal cover that's in the power board. I don't have how to measure temperature, but it was really hot, much more than the ICs. Not sure if this is normal though. I didn't want to leave it turned on much more. Do you think that the ICs are fried? In that case, it's pretty much not worth it to find substitutes? @Addam: Does your FC have a fuse somewhere? The 2 ICs that heated a lot may be defective. Try the diode test on them. Also, it's not normal the 7805 outputting 3v neither heating that much. The burnt smell makes pretty sure there's a short circuit somewhere and possibly are these ICs. They are the RAM of the console, the one that is connected to the 74LS373 being the CHR RAM, the other is the PRG RAM. Try to find what's causing the sort circuit before powering up again, if you need to test, watch the 5v output to see if the short is gone or more damage can be made. The CMOS RAMs (e.g. the TMM2115) tend to be some of the most easily damaged parts in a NES/Famicom. I wouldn't be surprised if that's why it's broken now. @FIsher: So I've done the diode test, using the thread you suggested to me. Even if some chips have slight different names and numbers I used the pin names found there. In the upper 2k x 8 SRAM I did'nt get infinity on any pin. - On Pins 14, 15, 16 and 17 when I test, the values move a bit and drop to zero. Seeing the image one of these pins is GND. - No pin has infinity. In the 74LS139 there's no pin with infinity. The 74LS373P guy has no pin with infinity either. Well, I have done this test twice both on saturday and sunday, to confirm the measures. I guess I have a few doomed chips and they are probably the cause of the short circuit. You can try to remove the suspicious chips and see if the sort circuit persists by watching the tension at the +5v line. Try to test it quickly or you can have the bad smell again and something more can be damaged. To do these kind of tests I used to unsolder the +5v and/or gnd, but I was told that's not a good practice so I recommend you to remove the suspicious chip entirely. Please, keep us informed of your progress. I desoldered the CPU and quickly measured the 7805 output. 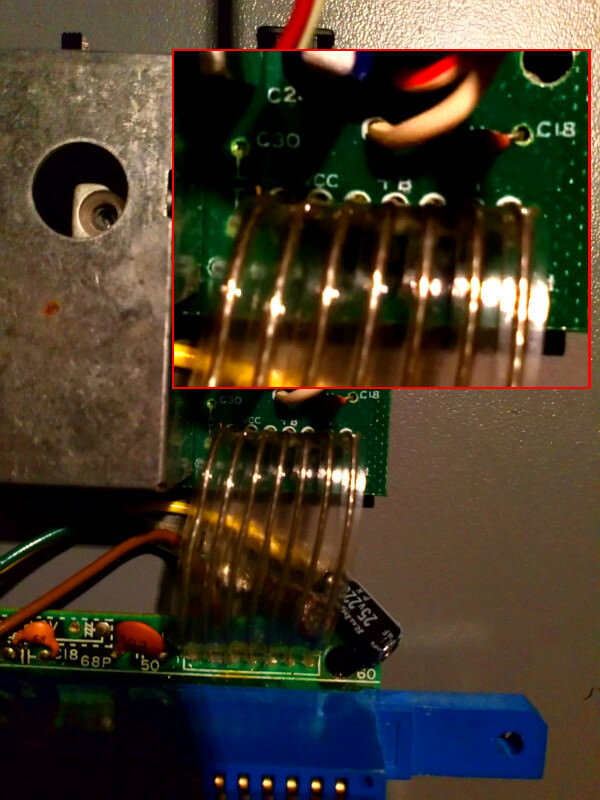 The outputted voltage measured around 3,7 volts. I was desoldering the ram and my unsoldering unit started working bad. I will try to fix it and go on tomorrow. Will keep posting the results. No fuse, I just replaced the 1000uf cap and found a suitable PSU. I was lucky, the damaged component was easy to find. You might need to do a little more diagnostics. Do you have a multimeter? Yes, I borrowed a multimeter from a friend. I followed what Fisher told me to test, so I made diode testing on all the IC's. I found that removing the CPU made voltage increase a bit, but it seems there's still a short circuit. I started de-soldering the suspicious ram chip but the desoldering unit was heating the chip way too much. I will go back at desoldering tonight.